The West Highland White Terrier or ‘Westie’ as they are affectionately known, is a member of the small group of Scottish National Breeds that includes the Scottish Terrier and also the Cairn, from which the Westie originated. Until the early 19th century Terriers tended to be dark in colour and it was not uncommon for hunters to mistake a brown terrier for a fox and shoot it by mistake. So the lightest coloured puppies of future litters were then kept in a bid to avoid these shooting accidents. These white terriers were then used to control vermin, including foxes and hares. They became known as the West Highland White Terrier in the first part of the 20th century. Westies generally live to 15 years of age, however older dogs are not unusual. 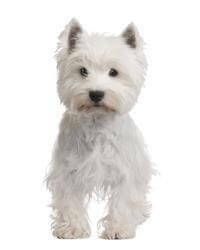 Westies possess the classic terrier temperament; they are active, alert, game and full of self-importance. It does need pampering, and this hardy breed enjoys scampering about in all weather types and will follow its owners just about anywhere. They are extremely faithful, but do have a stubborn streak and so early training is essential. Barking is a natural behaviour for Terrier Breeds and the Westie is no exception. The Westie is not an aggressive dog, but being a terrier will always be prepared to ‘stand its ground’. They were bred to hunt in packs and as such usually run happily with other dogs that show no aggression towards them. Westies also live happily with other pets especially when introduced as a puppy. This is a no wash-and-wear dog. Show dogs are trimmed by hand, plucking the coat with finger and thumb. Westies need to be trimmed at regular intervals (usually every three to four months) to remain presentable. Owners must keep up the combing and brushing, preferably daily. This brushing removes any dead hair and helps keep the coat clean. Unlike most other breeds, Westies do not moult in the normal way - they do not shed hair and therefore some asthma sufferers are able to live with a Westie when they have been unable to tolerate other breeds. As the Westie was bred to be an earth dog, it can be a great digger if not taught at an early age that they must not dig in your favourite flower bed. The Westie makes an ideal family pet as they are a great lover of human company. The Westie has a built-in sense of fun and adventure and enjoys exercise, whether it be a long country hike or a short trot around the block. They are extremely good with children and make an ideal companion for any individual.